Your hog roast will consist of a whole rare breed Pig traditionally farmed and locally sourced. Our chef will supervise the entire cooking period to ensure that the pork cooks evenly and remains succulent and flavoursome when the time comes to carve and serve it. You may even choose to have English Leg of Lamb or Spit Roasted Chickens or Poussins as an addition, all basted with our own special infused oils or spice rubs which help to impart a unique flavour to the meat when done. We offer a range of salads and choice of potato dish as well as accompanimenets and condiments usually served such as sage and onion stuffing, Cumberland sauce and apple sauce, mint jelly or sauce, mustards etc. For those non-meat eaters, we will be delighted to recommend equally delicious alternatives. Hog Roasts are an economical and fun way of serving larger numbers of guests, but we will gladly quote for smaller numbers. 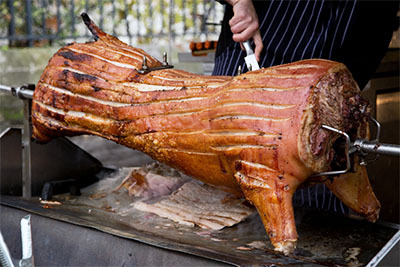 Basic Hog Roast serving up to 100 covers: from £550.00 when ordering salads & desserts. For a more formal affair, we can provide further staff, tablelinen and tableware.